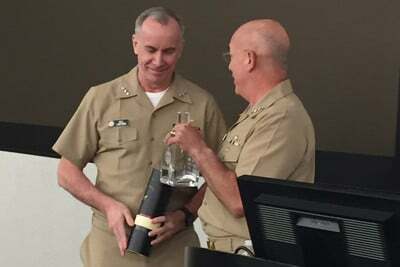 The reign of the Naval Academy’s Class of 1978 is over as Navy Adm. Kurt Tidd passed the Old Goat Award decanter to Vice Adm. Bill Lescher during a ceremony at the Navy Yard, here last week. The Old Goat Award is held by the oldest serving Naval Academy graduate, said Academy Superintendent Vice Adm. Ted Carter. Tidd, the current U.S. Southern Command commander, actually will hold the award until he retires. Tidd is the last of four members of the class of 1978 to hold the award – a record for the academy. Retired admirals Mark Ferguson, Cecil Haney and Harry Harris are all previous members of the class who were Old Goats. The lighthearted ceremony was part of the chief of naval operations three- and four-star gathering. Navy Adm. John Richardson, the class of 1982, poked fun at “the old and gray” goats. Lescher serves at the Pentagon as the deputy chief of naval operations for integration of capabilities and resources. Tidd, highlighting his time in Central and South America, also presented Lescher with a bottle of 23-year old Zacapa rum from Guatemala to fill the decanter. For the Navy this is a relatively recent tradition, starting with Navy Rear Adm. Alton Stock, who graduated from the academy in 1972.